The Organic Seed Alliance (OSA) will host its annual community field day and variety tasting on September 25th from 4 p.m. to 8 p.m. in Chimacum, Washington. All are invited to join in the celebration, taste new varieties of organic produce, and learn about OSA’s cutting-edge research in the field. In addition to the variety tasting, local chefs will serve appetizers that showcase the culinary potential of what’s growing in local trials. OSA is a local nonprofit with a national reach. It is known for its leadership in organic seed research, education, and advocacy, and participates in collaborative research with farmers, universities, and seed companies from coast to coast. The September gathering celebrates the third annual harvest at OSA’s Washington research farm, which serves as the hub of its Pacific Northwest organic plant breeding, seed education, and variety trial projects. The event also allows OSA to thank its strong and growing community of friends in the region and beyond. The field tour will be held from 4:30 p.m. to 5:30 p.m. with the variety tasting and chef showcase following from 6 p.m. to 8 p.m. OSA’s research farm is part of the Chimacum Farm Collaborative located at the Finnriver Orchard and Cidery, which will be open for no-host tastings and purchases. The event is free and open to the public. RSVPs are encouraged but not required. RSVP today at seedalliance.org/events. The Finnriver Orchard and Cidery is located at 124 Center Road, Chimacum, Washington, 98325. You may have noticed a lovely new sunflower gracing the pages of this website and our Facebook page. It is the centerpiece of our new logo, created by JoEllen Wang of Tiny Beast Design. All of us at the King County Seed Lending Library want to give a big thanks to JoEllen for her lovely design and hard work creating it. Thanks also to Krista Staudacher, our West Seattle coordinator, who worked closely with JoEllen to make it happen. JoEllen is a West Seattle architect who offers a full range of services to commercial and residential clients. This is the third logo for the King County Seed Lending Library. Our image has evolved from a dandelion seedhead to an umbel of parsley seeds. The sunflower was chosen for its cheeriness and abundant edible seeds. JoEllen also provided us with a color palette and a version of the logo to use on stamps, which will be used to label envelopes. The stamp will premiere at our annual Seed Swap, coming up next January. Free plants? And free seeds? Can it be true? 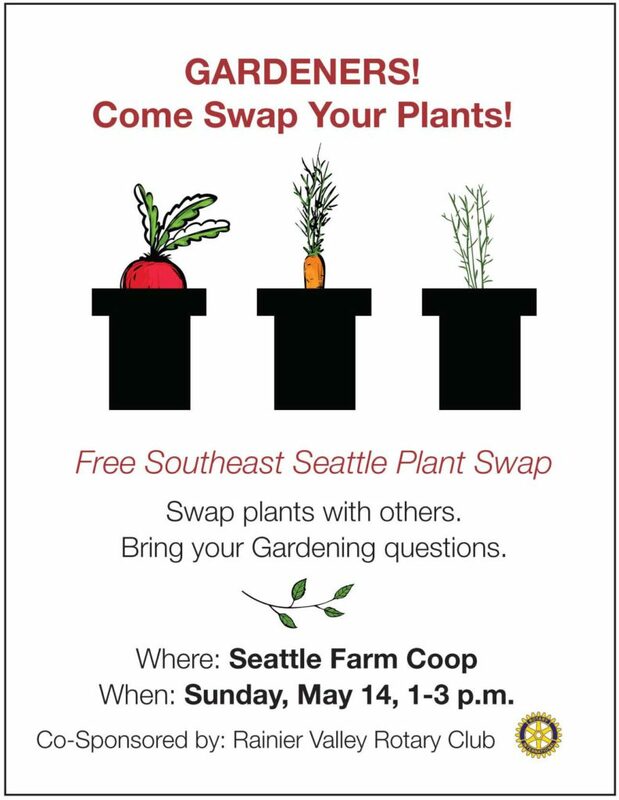 Yes, this Sunday, May 14, 1-3 p.m. at the Seattle Farm Co-op in Rainier Valley, gardeners can take part in a free plant swap. As if that’s not enough, the co-op will have edible seeds to browse and share — because they have become the newest location for the King County Seed Lending Library! The plant swap is co-sponsored by the farm co-op and the Rainier Valley Rotary Club. They invite all Southeast Seattle gardeners to bring plants to swap and bring gardening questions. The Farm Co-op store will be open, so you can browse the gardening supplies and animal feed. The co-op hours are 10 a.m. to 4 p.m. each Friday, Saturday and Sunday. One of the world’s most precious resources is at risk. 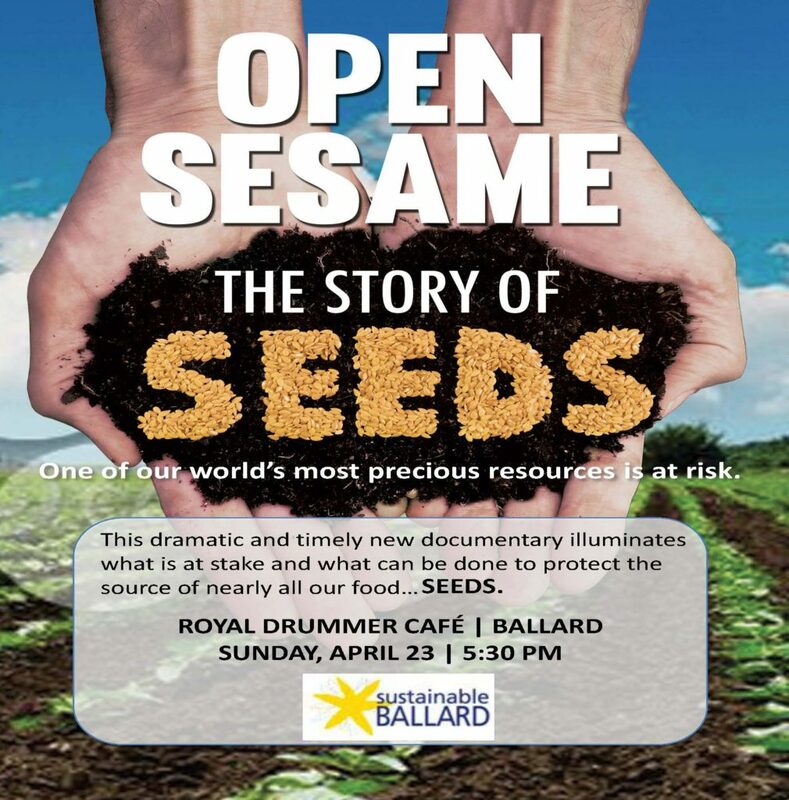 This timely and emotionally moving documentary, Open Sesame: The Story of Seeds, being shown this Sunday in Seattle’s Ballard neighborhood, illuminates what is at stake and what can be done to protect and nurture our seed supply. Sustainable Ballard’s Meaningful Movies is hosting, and the King County Seed Lending Library will be on hand for information and to hand out free seeds. Coordinator Bill Thorness will lead a discussion on the issue after the film. The film will be shown at the Royal Drummer Cafe, 6420 24th Ave. NW. The cafe will offer its full menu (sandwiches, salads, coffee, beer and wine). Seeds provide the basis for everything from fabric, to food to fuels. Seeds are as essential to life as the air we breathe or water we drink…but given far less attention. According to the Food and Agriculture Organization of the United Nations (FAO), approximately 90 percent of the fruit and vegetable varieties that existed 100 years ago no longer exist today. Heritage grain is near extinction. Seeds that were lovingly nurtured over decades or even hundreds of years have been lost forever. And yet, seed diversity is more important than ever. Maintaining seed biodiversity allows breeders to create new varieties that are resistant to pests or thrive in temperature extremes. This is essential in a changing climate. Meanwhile, corporations are co-opting seed genetics using patent law and just a few large companies control the vast majority of the seed supply. In this film you will meet a diverse range of individuals whose lives center around seeds. Farmers. Renegade gardeners. Passionate seed savers. Artists. Seed activists. This film tells the story of seeds by following their challenges and triumphs as they work to save this precious resource. Sustainable Ballard’s Meaningful Movies screenings are free, but a $5 donation to offset costs is appreciated. Come early, as the Royal Drummer will be offering happy hour prices on its entire menu before the screening. An estimated 150 gardeners attended the Great Seattle Seed Swap yesterday, scooping small handfuls of seeds into packets, sitting in on short workshops, and visiting with non-profits and Krista Rome from guest seed company Resilient Seeds. It felt good to rub elbows with other gardeners intent on planning their 2017 vegetable garden, even though it’s too early to plant. Here are some images from the event. Paige, assisted by online searches, helped shoppers identify traits of plant varieties offered. An attendee checked a list of desired seeds. P-Patch staff warmly greeted gardeners and shared info on their program. 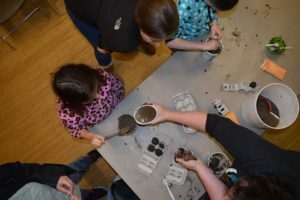 Christy of the Seattle Farm Co-op added water to a soil-and-seed mixture that was turned into “seed balls” filled with pollinator-attracting flower seeds for a young attendee. Laura from Seattle Tilth shared tips on basic seed saving in a well-attended workshop. A giant allium seedhead contributed by an attendee. Beans and peas were popular. Attendees lined the tables to package and share seeds. Many brought packages from their own gardens. A seed screen at a demo table. If you couldn’t attend this one, see our Events listing for more area seed swaps. We are a community of seed savers and sharers located in the Seattle area. We support our bioregional seed companies, educate gardeners about seed-saving, and host community seed events. Enjoy your visit!